Mobile AR Project – Boom! BOOM! is a playful AR product that captures user’s thoughts and feelings, applies them to lifeless faces in the city such as posters and statues, and shares them with other people. It detects human faces shape of any kind (faces in posters, pictures, drawings, sculptures or statues, etc) and places a speech balloon of the user’s thoughts next to the detected face. It uses face detection technology to detect a face, and speech-to-text technology to recognize user’s speech and convert it into text. The beginning of this concept rose from our daily scene in the New York City, a hub for art and culture. Every day we are surrounded by hundreds of human faces whether they are a part of posters and pictures on the wall, statues in the park, paintings and sculptures in the museum, and whether they are alive or lifeless. Those faces, especially inanimate ones, inspired us to think about the potential of communications between people in the city by augmenting those faces. Today, we are surrounded by a number of faces. No matter where we are located in the world, if we have a small smart device, we can log into “facebook”, which is a book with faces, “Instagram”, or “Snapchat” and encounter many faces: faces that we have seen every day, faces that we have seen a couple of times, or faces that we have never seen in our lives. These faces in the digital world are flattened 2D images of the living people in the real world. They are placed within a rectangular screen and as we scroll down the feed, we see those faces unconsciously thinking that people with those faces are breathing somewhere in this real world. Like this, we confront and consume countless faces of living people, as well as their small notes every day. What would it look like if there is a virtual world where lifeless faces can communicate with us? What if posters, statues, sculptures, and mannequin can talk? What if there is a “facebook” in spacetime version? Finally, we decided to create a mobile app that uses AR technology to capture the moments or to write random things in the virtual world next to the objects of lifeless faces in the real world. 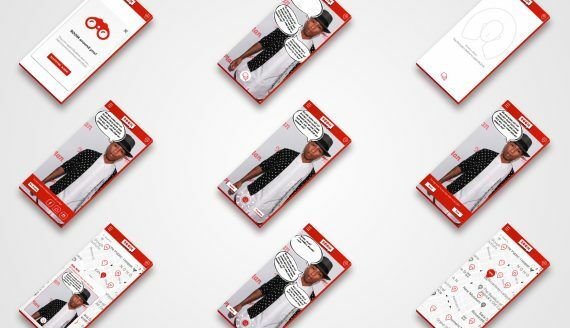 The reason we chose the AR feature is that users can have a lot more freedom in their creation of speech balloons in terms of design, content, and composition than when using other traditional methods like using physical stickers.